For those of you following the evolving Microsoft Partner Competency program, there’s a new and interesting twist recently announced by the Microsoft Partner team. At the enterprise level, what was once independent CRM and ERP competencies (either Silver or Gold) will merge into a single Cloud Business Applications Competency at the end of this year. This change brings about a few questions and several potential ramifications. You might want to get caught up on the changes if you’re in the partner community – certainly – but also customers and the industry followers at large will be impacted. I don’t have a crystal ball, but I’m very curious to know what happens with partners who are on either side and now being asked to merge to a single competency. The Cloud Customer Relationship Management (CRM) Competency is retiring October 1, 2020. The last day to attain or renew this competency is September 30, 2019. The Enterprise Resource Planning (ERP) Competency requirements will be updated in October 2019. 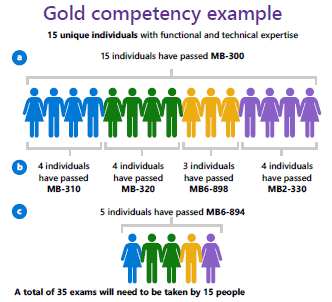 New role-based exams will be introduced to the Cloud Business Applications Competency in July 2019. Additional role-based exams will be added in 2020. The Cloud Business Applications Competency requirements will be updated in July 2019. CRM partners will not be able to attain this competency after September of this year. Those partners committed to Dynamic CRM (D365 Sales, Marketing, Service, Field Service) are being encouraged by Microsoft to go after the Cloud Business Applications Competency before the anniversary date of their CRM Competency. If you haven’t started yet, you might want to get going. The requirements for the new certification are pretty steep. But more on that later. Unlike CRM, the ERP competency won’t just vanish, but it’s changing significantly. Though the name doesn’t identify it, the emphasis on the change seems to be between Enterprise and SMB markets. The “new” ERP Competency will only be awarded for NAV, GP, SL and Business Central partners, and will not include Dynamics 365 Finance and Operations. Microsoft Competencies are awarded after achieving multiple milestones related to selling and delivering products to end customers. Requirements to attain this Competency (at first glance) seem to only be satisfied by building proficiency in Business Central. While revenue performance from all on premise products will be counted, only Business Central will have certifications that qualify for this competency. To me, it seems clear where Microsoft wants GP and NAV partners to focus. Those Finance and Ops partners that tout Gold ERP competency will need to find a new home. And like the CRM Competency, Microsoft is encouraging those partners to pursue the Cloud Business Applications route as they transition their practice. What’s in this new Cloud Business Applications Competency? Well that’s a great question. There’s quite a bit to unpack here. For starters there are two tracks a partner can take to earn this competency. Within the single brand of the CBA comp, you can effectively choose to qualify on your Dynamics 365 Customer Engagement revenue and certifications or your Dynamics 365 Operations revenue and certifications. You can’t add the two together, however. It’s got to be one or the other to make Silver and then Gold levels. And the requirements for those levels has jumped significantly. Seems weird that a partner with only CRM or ERP experience will market themselves as Cloud Business Applications partners with no specifically identifiable difference. 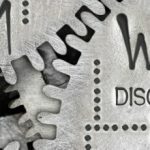 There’s already a lot of confusion about Dynamics 365 related to the name changes, and many new customers assume it’s a single product. This new branding for partners perpetuates that inaccuracy and adds significant overhead to explaining the difference to customers who are buying now or may have even already bought the product. Diving into the specifics of the competency, there’s even more to unveil. You can read the specifics of the new requirements on Microsoft’s own page, but here’s a simple break down for the CRM track. Similar requirements exist for the ERP track. The main takeaway I see is that more people will need more certifications. But also, you’ll need to have several people who maintain both functional and technical certifications. In CRM this may make more sense than in ERP. Or maybe I’m biased. I think our industry will struggle to find people to honestly and ethically pass the Development exams for Dynamics 365 F&O and also pass the Financials or Supply Chain exam. This is clearly how Microsoft see’s a “Solution Architect” but it also seems a tall ask and going to cause some friction as partners get retooled for this requirement. 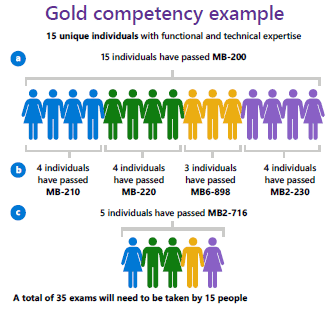 *Note that many exams are changing in July of this year, so please double check my math on this before assuming you’ve made the competency requirements. This is more to illustrate a point. CRM partners and ERP partners will be working towards the same competency which happens to include the biggest leap up market in requirements for partners I’ve ever seen. This is driving more certified individuals and a broader set of certifications required to qualify as “competent” in Cloud Business Applications. And while some of us in the Dynamics space service both ERP and CRM, certainly a large portion of the community is still siloed. That seems unacceptable to Microsoft if you interpret their competency strategy as a means to direct their partner channel. So, I’d expect more consolidation between partners, and I’d also expect more confusion with customers. Ultimately this might be the right direction we need to move as an industry, but with fundamental shifts like this there’s always some friction in the process. Did I miss the mark, or bury the lead? I’d love to hear what you think about these changes or others you’ve heard are coming. Find me on LinkedIn or Twitter to continue the conversation!